NorthStar ACE is a fully integrated solution combining Bluetooth communication with an IoT concept. First of all the user interface has been improved: the overview better adopts to the installed system. And behind each entry in the device list, you can now see the main parameters. Secondly, v2.00 marks the release of ESS. Short for Energy Storage System, it is the result of all experiences learned from the Hubs. We have combined all options in one, simplifying setup and configuration. Also, ESS has several new features, and it is much easier to understand how it works and why it is doing what it is doing. Most of the Hub-1 and Hub-2 policies are now deprecated for new installs, as is the Hub-4 Assistant. Note that, unlike previous versions, v2.00 will not automatically install itself. This ‘one time’ upgrade procedure is explained here. Now with all that out of the way, get a coffee or tea and start reading. There is so much news that even after all the time spent writing this blog post, I am still not entirely sure if everything is covered properly! Note that for ESS there be a webinar to explain all the new functionalities. The overview can now show both MPPT Solar Charger power and PV Inverter power at the same time. You may have noticed the temperature sensors and three fuel tanks: this screenshot has been taken from a Venus GX, a new product on which we’ll explain more next year. Short for Energy Storage System, ESS is a combination of standard multipurpose Victron products, together configured for ESS. In the system, there must at least be one inverter/charger and also the CCGX. The Multi or Quattro is configured with the ESS Assistant. feed power from MPPT Solar Chargers back to the grid (like Hub-1 did) or not, if you don’t want that. use (part of) the battery to optimise self-consumption. Or not, and just always keep the batteries charged. This is really handy when diagnosing issues on split and three-phase installations. The phase information is also visible on the VRM Portal and alarm emails. Also, the high DC ripple alarm is now shown per phase. Use this option to restart a system once it has locked itself out. This means it’s no longer required to switch all units off one by one and then switch them back on again by using the rocker switches on the Multi or Quattro. Also, using Remote Console, this can now be done remotely! This user setting has been removed: there is no need to set it manually as the CCGX will now activate it automatically when it detects that there is a Multi or Quattro installed, and an external battery monitor. To get proper state of charge reading for the battery, it used to be necessary to install a BMV for systems with MPPT Solar Chargers. Not anymore: the CCGX will continuously inform the Multis or Quattros about the MPPT charge current, which is then used in the SOC algorithm. The ESS system can control the Fronius Power Reduction feature, resulting in a nice zero feed-in system. Herewith, it is no longer necessary to use the Prevent feedback option of the Hub-2 Assistant. By staying connected to the grid, instead of switching back and forth to inverter mode, flickering of lights, and also the occasional (avoidable) overload shut down are now eliminated. Well, so what? If they do allow it, while not charging you for feedback and also not disconnecting you, please just let the PV Inverter do its feedback. The system will be more stable: no switching back and forth to inverter mode. 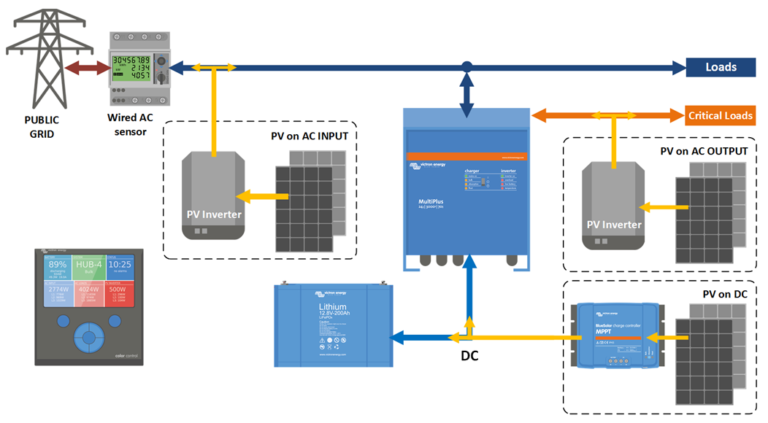 Though everyone is free to prefer one solution over another, I do recommend strongly to reconsider: technically, preventing feedback of a PV Inverter by going into inverter mode and starting to frequency shift, can be done. But the technologies used, switching back and forth to inverter-mode and altering AC frequency, are not ingredients that help in creating a stable and smooth running power system. While that (a stable and smooth running power system) is what the end-user of such a system is used to. After boot of the CCGX, it might first charge the battery with ~500W for a minute or so. If the Int + SF setting is not available in the Fronius PV Inverter, you need to update its firmware to a more recent version. Contact Fronius. The feature can be enabled in the menu Settings -> Energy storage system. There is a new feature: “Do not run genset when AC 1 is in use”. It is intended for backup systems, with a Quattro, having mains on AC in 1, and Genset on AC in 2. When this option is enabled, the Genset will only be started after a mains failure. And in the case of a mains failure, the Genset will automatically be stopped again as soon as the mains is restored. It now updates the full file system, instead of bits and pieces. Fixed the issue that the device could be ‘bricked’ during the firmware update process: no matter when you cut the power, it will always recover. No more “my Color Control GX only shows the blue logo, what should I do?” complaints. Download updates via https instead of http: more secure. Better user interaction: the GUI now properly warns that a download and install has started. Also, it warns that the device has initiated a reboot. Added many new fields: all the fields of com.victronenergy.system, which are the values shown by the GUI. This makes it a lot easier to always obtain, for example, the system battery state of charge from the same registerid. System information is available at unitid 0. Add 9600 baud to the supported USB GPS baud rates. Fix a bug that made it impossible to switch the inverter on from the boat & motorhome overview. Improved functionality in the Network page on Windows as well as other systems that use upnp: clicking the icon now leads to the Remote Console on LAN page. Improved Phoenix inverter page: Show AC power, Remove AC voltage decimals, Prevent displaying negative AC current. Renamed Wired AC Sensors to Energy meters: Energy meter is our new name for the Carlo Gavazzi meters. Add Czech to the list of available languages. Thank you Jiri Zeman from Neosolar! How to update to v2.00Unlike previous updates, v2.00 can not be installed from the internet. Instead it needs a one time manual upgrade. After this, future updates can be installed automatically from the internet once again. 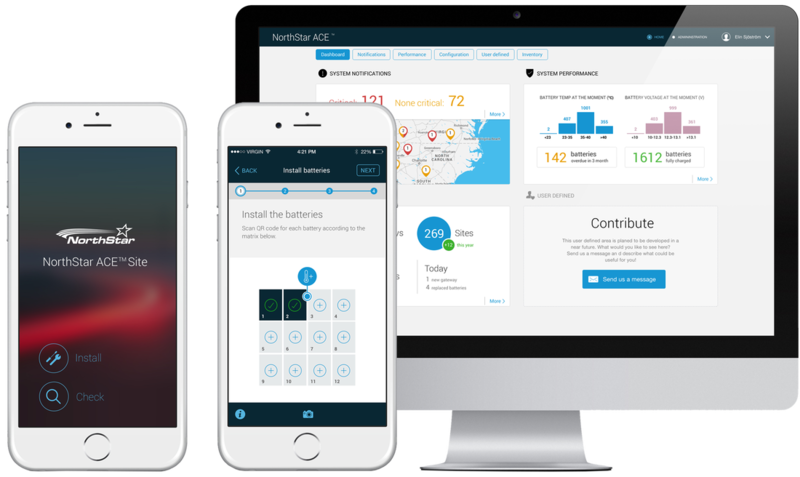 ​NorthStar introduces a groundbreaking remote management solution, named NorthStar ACE™ (Advanced Connected Energy), that will change the way energy storage is managed. NorthStar ACE™ will be deployed in select installations during Q4 2016 and be fully available in the market from Q1 2017. About 15-20 million batteries are purchased each year for telecom site backup power. More than 50 percent of these are replaced prematurely due to insufficient control throughout the product life cycle. Batteries are not properly managed and maintained in warehouses, installations are incorrectly performed and in operation the batteries are exposed to suboptimal power system settings, elevated temperatures and theft, resulting in shortened battery life. With NorthStar ACE™, this is about to change. “Voice and data service is something that many take for granted. But in the end it all comes down to having reliable power. NorthStar ACE™ will give operators and tower companies a powerful solution to gain full visibility and control of their energy storage, without even having to set foot on site. We will see the total cost of ownership reduce dramatically, as NorthStar ACE™ helps prevent most battery failures, thereby increasing network uptime and reducing costs for batteries and related operating expenses”, says NorthStar’s CEO Hans Lidén. NorthStar ACE™ is a fully integrated and cost optimized solution combining Bluetooth communication with an Internet of Things (IoT) concept. The user can retrieve real time and historical performance data wirelessly, both locally through a smartphone app and remotely through a cloud service. The batteries are managed from manufacturing throughout the life of the product. The cloud service is built with a fleet management approach, where data is aggregated and displayed on a network level, but still only requires a few clicks to display detailed data for a single site or battery. “Until now a battery has been seen as a passive component that is installed and then forgotten. Our NorthStar ACE™ concept is about to change this completely by bringing innovation together with true and tangible customer values and make AGM technology an optimal opex/capex balance for the coming years”, says Hans Lidén. NorthStar ACE™ is well received among key customers who have been introduced to the solution and is seen as a true game changer in the industry. The solution will be fully available from Q1 2017. It will initially target telecom and other standby applications, with plans to move the technology into other applications in the near future. The battery mega store has some fantastic offers on commercial and automotive batteries. Got to www.batterymegastore.co.uk to shop now! We are pleased to announce the launch of our new website! This site is to rung along our online store and provide a point of contact for a more commercial client base. Please have a look round and don't hesitate to post your opinions below. The site was designed by Troy at HW Marketing and we would highly recommend them. We have some very exciting things planned for 2017 and will be keeping you up to date with this blog. We plan to post weekly updates about what we're doing, our plans and special offers. 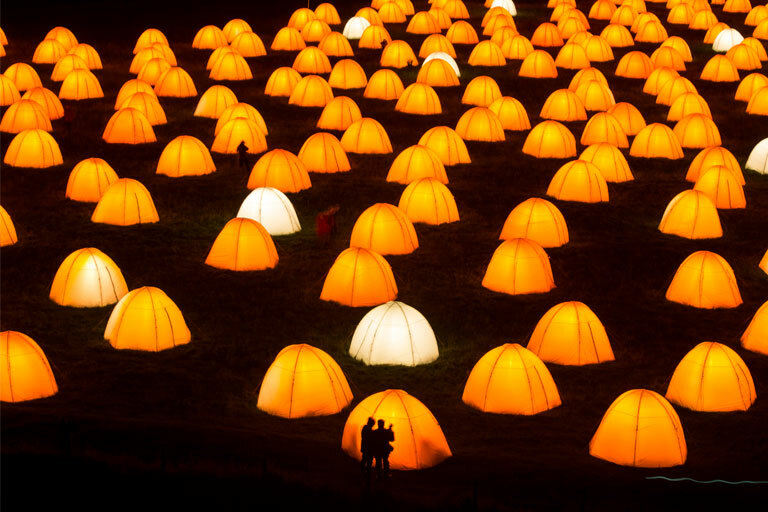 ​During the summer of London 2012, something extraordinary happened.Eight murmuring, glowing encampments appeared simultaneously at some of the UK’s most beautiful and remote coastal locations, from County Antrim to the tip of Cornwall, from the Isle of Lewis to the Sussex cliffs. Designed to be visited between dusk and dawn, Peace Camp was a poignant exploration of love poetry and a celebration of the extraordinary variety and beauty of our coastline. Alongside the live installations, the project also painted an oral portrait of the nation online. The people of the UK were asked to nominate and record their favourite love poems and submit their own messages. The collection was archived with the British Library, an anthology that celebrates our languages, dialects and accents as well as our rich poetic tradition. Peace Camp was co-commissioned by London 2012 Festival and Derry~Londonderry City of Culture 2013.